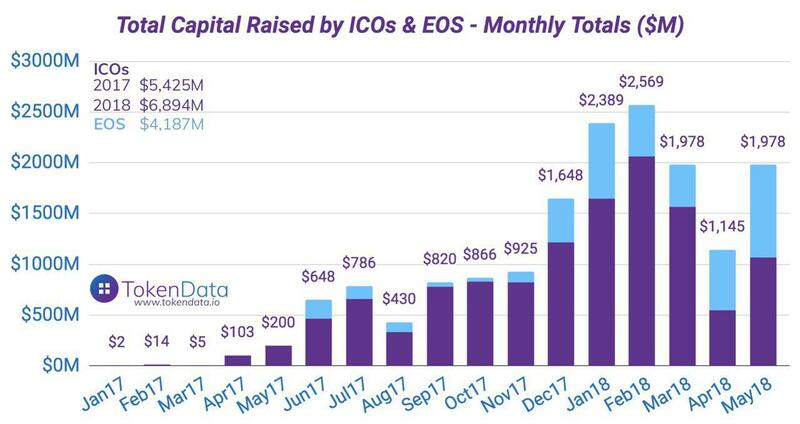 By the time we publish this issue, the year-long ICO for EOS tokens orchestrated by Block.one would have ended, raising in total north of $4B worth of ether. To put things in perspective, there have been only two IPOs (with a "P") that have raised more capital in 2018 so far, as the author points out. On June 2nd Block.one has also released v1.0 of the EOS.IO Software under an open-source licence. From now on it will stop operating it, retaining 10% of all EOS supply and 100% of the proceeds raised, without having yet clearly outlined uses of capital, beyond committing to a number of ecosystem funds to the tune of $1B. No lack of last minute drama either, with news of 'epic vulnerabilities' in the code spreading online this week suggesting the long awaited launch could be delayed. The Twitter EOS account denied the delay saying most bugs had already been fixed, while Dan Larimer offered $10k in bounties for finding other 'critical bugs'. Not to mention the dozens of EOS related scammy phishing emails that we all got in the last few days, and many fell for sadly. PS: Tezos betanet is also coming very soon. PPS: Stefano is still massively skeptical about the $4B sum, given the rolling nature of the offering and the opportunities for arbitrage, but Block.one clearly states in the EOS FAQ that they would not engage this practice, promising an independent 3rd party audit at some point. Would be really nice for total transparency to have an official final sum from the company verified by reputable auditors. If the $4B value is true, then this was the most masterful fundraise ever created, with the daily sale auction gimmick. This is a contrarian post that we missed last week and that would have been a great counter to Stephen McKeon's "The Security Token Thesis" covered in our previous issue. Michael's argument is that all the beautiful things security tokens are supposed to enable or solve are already largely possible today, or there's a very good reason why they are not implemented already in traditional securities (ie feature rather than bug). Michael however admits some new types of tokenized securities uniquely enabled by decentralized protocols would indeed by interesting (eg a security NFT representing a single wine bottle or vintage). I think here the debate is starting to go round in circles because we keep calling these things 'tokens', when they are in fact just 'digital securities' and they already exist in some form. "The token itself is an abstraction that derives value not just from the asset itself, but from the institutions that assure that abstraction maps to the value we wish to “own.”"
So he's main point is: yes, it's technically possible, but why on earth would you use a blockchain for that? I think that's enough for security tokens this week! Apparently Estcoin won't be a new "currency" but it will still be some kind of token that "will proceed as a means for transactions inside the e-resident community”. In any case, an ICO for a national cryptocurrency is just a pure idiocy, while instead having a crypto-fiat, especially if with different value systems and different distribution than the current fiat is an idea that intrigues us a lot. I'm an e-resident of Estonia, so we'll keep you updated on what it will look like in the end. The WSJ takes a super cool look at a paper mentioned in the Bitcoin paper. This specific paper resulted in a company, Surety, and a patent: the first blockchain patent, with the use case of time-stamping digital files - a use case much touted about today, but that has been possible to achieve since the 90's..
A super interesting post by the Tezos founder about the baking, delegation, endorsing mechanics that will happen in when Tezos launches. It's quite a new and different model. This new gold-mining-rush that's happening is quite fascinating, and will be even more so when Ethereum launches its own staking implementation. Who would have thought just a few years ago that we'd develop an entirely new industry of digital mining. Consensys published a state of the nation on the Ethereum network and its community. Despite all the scaling challenges and the window of opportunity potentially opening up for competing Dapp platforms, Ethereum has so far undoubtedly managed to secure a solid first mover advantage with developers mindshare. There's a brand new category of digitally native, AI-driven artistic expression that is emerging, uniquely enabled by the provable digital scarcity of blockchains. One day in a not so distant future, you'll be visiting a Decentraland art gallery featuring the hottest crypto artist of the moment, wearing your VR goggles comfortably sitting in you armchair. After raising $100M for a non-crypto token, Kik's CEO, Ted Livingston, has the audacity of saying that there are few convincing use cases of blockchain tech, and that it isn't for everyone. Livingston said that the cryptocurrency game is the only way to compete with the titans of tech. Look, I get it. He might even be right. I just hope that if they ever deliver Kin, it will be a massively important technological advance, because after all this money and talk, that's the bar they're setting. In the meantime, there are no dates for delivery due to technical problems with Ethereum, so they're rebuilding everything with a new blockchain that's a mix between Ethereum and Stellar..
Another incredible story of a scammy ICO from the New York Times (which is doing great work on the space together with the WJS). This one is about Envion, a never-heard-before-here ICO that apparently raised $100M for some mobile Bitcoin rigs (really?). We're out of words about #1 the ability of people to come up with crazy ideas the public will believe in, which I think is a real skill and #2 said public believing in them and giving them money no questions asked. Not sure it'll ever end at this point, but if it does, it won't be a happy ending. Building blockchain apps is fundamentally different from normal web and mobile apps. But our understanding of how to do it still has to evolve. A good first stab at defining some practices comes from the winners of the Consensus Hackathon. Good read if you're trying to build consumer dapps. Invesco, the large asset manager, published a long report that includes an extensive section on the crypto asset class, opportunities and risk. Including a Q&A with Chris Burniske of Placeholder. - On the move. Ripple has lured Ethan Beard away from Facebook, where he headed up its developer network, to run Xpring, the XRP ecosystem initiative announced earlier in May. - Lawsuits. Axiom Zen, the creators of CryptoKitty, is being sued for stealing the idea of a Stephen Curry's crypto collectible (a campaign now paused) from Tradestar, who shared it via NDA. - M&A. It looks like the BitGo / Kingdom Trust acquisition fell through and BitGo will build its own custodian service instead. - Traction (I) Brave browser has crossed +5m downloads on Google Play, only 6 months after the 1m downloads milestone. That's some serious exponential growth: 0-1m in 14 months, 1-5 in 6 months (excluding desktop and iOS). Impressive. - Traction (II) Blockchain.com hits 25M wallets. - Mining wars. Z-cash Zooko had a video chat with Bitmain Jihan encouraging him to be more transparent about his operations. These are his notes. Some juicy details in there such as Bitmain's cap table, 2017 revenues and latest valuation. - Airdropping. DFINITY is planning the largest airdrop on history, working with CoinList's newly launched compliant airdrop platform on distributing away $35M worth of tokens to its community (guaranteeing at least 100 DFN each). Not to US residents though, for regulatory reasons (ie airdrops are likely to be considered securities offering!). Is this going to be the standard in a post-ICO world? The team at Set Protocol have launched their flagship product TokenSets on mainnet. It will initially feature 3 Sets (top 10 ERC20 tokens by market cap, stable coins and dexes) that can be bundled / unbundled and traded on RadarRelay. Pretty interesting little site that emerged on the back of the recent Bitcoin Gold 51% attack. It attempts to estimate the cost of performing 51% attack on a list of networks by calculating the cost of renting enough hashing power from Nicehash to match the current network hashing power for an hour (in reality the cost could be even lower thanks to block rewards an attacked who earn while performing the attack). The results look pretty scary and mind-blowing, though not always accurate by the look of it. Origin released a massive new update, with some really cool stuff, most notably the support for ERC725, the standard for identity on top of ETH. You can try it out on Rinkeby and Ropsten here. The MyCrypto team released MoneroVision this week, an open-source Monero block explorer, super simple but cool. The May '18 draft ICO numbers are out, as always thanks to Tokendata. It looks like it was a $1B month, plus an extra billion from EOS in their final month. Apparently lots of activity coming from Korea and, as always in recent months, many of the large ones done entirely privately (e.g Orbs $118M, Flashmony $72M and Videocoin $50M). "The Company intends to implement blockchain technology onto its E-commerce platform worldwide, which will be driven by Monster Money Tokens. The Company’s blockchain-based E-commerce ecosystem is named as “Monster Money Network.” As Monster further develops Monster Money Network and its blockchain technology, it contemplates to utilizing the blockchain technology for payment processing, market analysis, accounting, audit & payroll services, inventory management and shipping operation." "Monster Money Tokens are the currency to be used on Monster Money Network to purchase Monster products or pay for services. Holders of Monster Money Tokens are not entitled to vote as shareholders of the Company." "we consider Amazon, E-bay and Alibaba as examples of our main competitors with respect to the new Monster Money Network"
Interestingly, tokens can be converted into equity in Monster if by June 2020 tokens are not listed anywhere or have ceased trading. I'm sure there are more juicy bits disseminated across the SEC filing, but frankly we'd rather spend our time on other stuff. Another enforcement action by the SEC. This time it's addressed at Titanium Blockchain Infrastructure and its President for committing securities fraud in raising as much as $21M in an ICO. The SEC obtained a court order to halt the sale and to freeze the assets, on the grounds that the issuer has outright lied about testimonials and corporate customers in the ICO materials. For a more thorough dissection of the SEC complaint we refer you to Stephen Palley's tweetstorm. As a general rule of thumb, if an early stage pre-launch project claims to have the likes of IBM, GE, Intel, Microsoft etc as actual 'clients', always be very suspicious. But when someone claims the Federal Reserve is a client, have no doubts and run for the emergency exit. Binance have announced the imminent launch of a $1B ecosystem fund investing directly into projects and as LP into 20 other funds, contributing in BNB tokens. Apparently part of the fund's profits will be used to buy back BNB tokens, and if that's the case the performance of the fund may end up partially proxied by BNB network value (and BNB become effectively a security?). If the money will be go through Malta, that's another great win for the small country. Meanwhile, CZ passed by a few km from where we live, so the karma is all around great. Behind paywall, archive link here. VCs who caught the crypto bug continue to feel antsy inside their legacy generalist funds. So it's not entirely surprising that Matt is leaving Sequoia to start a crypto fund. Sequoia is expected to commit to the fund, but will likely continue to invest on its own in the space. Matt invested in Polychain and Metastable out of Sequoia, as well as Orchid and Filecoin's ICO. Japan’s gumi just announced a $30M fund who will be led by Gumi founder and CEO Hironao Kunimitsu and Miko Matsumura. Yet another EOS ecosystem fund was announced in conjunction with the release on June 2nd. This is a $50M one in partnership with a London-based crypto fund called SVK Crypto and led by Hugh Cochrane and Shane Kehoe. "It will invest in projects that are building on the EOSIO blockchain platform, with a focus on decentralized applications (DAPPs) for social media, data ownership, data control, technology platforms, supply chains and logistics." imToken has announced that they have 4m users and hold $35B in cryptocurrencies. The occasion is the announcement of their $10M Series A raise from IDG. BRD is yet another crypto wallet, based in Switzerland with $6B in deposits. "The round included a combination of venture capital funding, with existing investor East Ventures involved the round, and a crowdsale."